This APOLLO 11 50th Anniversary complete 2-coin set is a treasured collectible. Here is your chance to own beautifully colorized JFK Kennedy Half Dollar U.S. Coins. This Apollo 11 2-coin set commemorates the 50th anniversary of the first human landing on the moon. On July 20, 1969, after the Apollo 1 tragedy and series of successful tests in Earth and lunar orbit, Apollo 11 astronauts Neil Armstrong and Buzz Aldrin guided their Eagle lander to Tranquility Base on the surface of the moon while crewmate Michael Collins circled above inside the command module Columbia. The Apollo missions were the answer to a challenge issued by President John F. Kennedy to put a man on the moon. The landing marked success for the U.S. over the Soviet Union, and has since been billed as the Space Race. This remains among NASA's pinnacle achievement since its inception. Each coin comes in a premium coin capsule. 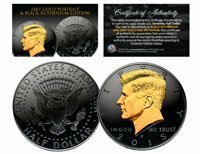 The set comes with a Certificate of Authenticity to guarantee that your coins are authentic and recognized by every monetary authority around the world, assuring its Collector Edition status. Images on the coins are from the Original 1969 NASA Buttons. Armstrong, Collins, Aldrin...first Man on Moon.